Copyright © 2014 -2019, W.H.Wax. All Rights Reserved. All prints are made in Ruston, Louisiana, U.S.A.
Each Archival Giclée Print comes with a Certificate of Authenticity signed and hand embossed by Fine Line Archival Printing and myself. This is as close as you can get to owning the original without paying the original price. What is an Archival Print? ​Sometimes called "Giclée Prints", Archival prints are made with an ultra-high-resolution fine-art printer, using the very finest archival inks and papers. Independent testing by Wilhelm Imaging Research Inc. (a world-leader in image-longevity testing) has established that these "Archival-Prints" will last more than 200 years before any noticeable shift in color integrity occurs. They are truly "Museum Quality Fine-Art Prints". A limited edition is a work of art which is produced in small numbers so that each one will be valuable in the future. each print is signed by the artist in pencil, and numbered such as 48/100 to show the unique number of that print and the total edition size. Each premium archival limited edition giclée prints are captured from the original artwork and created with 100% quality cotton paper and fine pigment inks, Each print comes hand embossed, signed and numbered, with a hand embossed certificate of authenticity signed by myself and Fine Line Supply Company archival printing. Bistineau Landing - click here to Buy Now! Bistineau Landing is actually my second piece in a series of three featuring the American wood duck, the mallard drake and hen, and the final will be the pintail. I grew up fishing and watching the ducks fly in on Lake Bistineau near Doyline, Louisiana so I thought the name "Bistineau Landing" was fitting. I absolutely love to draw and this series is one of my favorites. These are Limited Edition Premium Archival Giclée Prints each hand embossed, signed and numbered by the artist. ​The original piece measures 11"X14" and was drawn on archival 98 lb paper with the finest coloured pencils. Available in 8"x10", 11"x14", 16"x20" fine art natural paper, the very limited edition 16"x20" museum etching paper limited to 100 prints, and 11"x14" Canvas Print limited to 150. Prices range from $25.00 to $125.00. Size and price options available when you click the button below the artwork. Also included with each print is a Certificate of Authenticity signed by the artist and the printer. American Wood Duck - click here to Buy Now! The American Wood Duck is the first piece in a series of three featuring the American wood duck, the mallard drake and hen, and the final will be the pintail. This piece is based on an area not too far from where I grew up. I ran trotlines and throw lines in this actual area fishing for channel cat and high fin blue catfish on Lake Bistineau near Doyline, Louisiana. Many times I would go out to check my lines and scare up mallard ducks and occasionally wood ducks. I even saw a bald eagle in this area once which is a great idea for a future piece. I have always loved the level of detail that drawing and painting wildlife offers while trying to create and maintain my own style. I traveled to many art shows and festivals displaying and selling my work and The American Wood Duck was the most popular top seller. The original was sold in Vicksburg and resides in Mississippi. "Bath Time" - Buy Now! Although I do work in oil and watercolor, all of my artwork on this site is coloured pencil, graphite, and acrylic using only the finest quality pencils and paints. "IT'S A LOUISIANA THING" - BUY NOW! BAKER SCHOOL - click here to BUY NOW! EVERGREEN PLANTATION - BUT NOW! It was a great opportunity to illustrate and design "Whistle" a children's book by Author Patsy Moore and Ally Gator Book Bites Publishing House of Lake Charles, Louisiana.There are 24 illustrations in all. Whistle Cover - Buy Now! Lucky # 7 is a series I am particularly proud of. I came up with the idea to create a new illustration every two or three months based on my life from childhood until I was too old to draw any more. My greatest artistic influence is Norman Rockwell so I have tried to incorporate a little of his style in each illustration. ​I did take a long break from the series but now two new illustrations and a children's book titled "The Life and Times of Lucky # 7" © are in the works! ​Lucky # 7 Gone Fishin' is the second illustration in the series. This illustration is based on my love for fishing and for the Ouachita National Forest near Gillham, Arkansas all the way up to Mena, Arkansas. Both sides of my family are from the area, so I spent a lot of time in the mountains and I lived near the mountains in Wickes, Arkansas as a teenager. 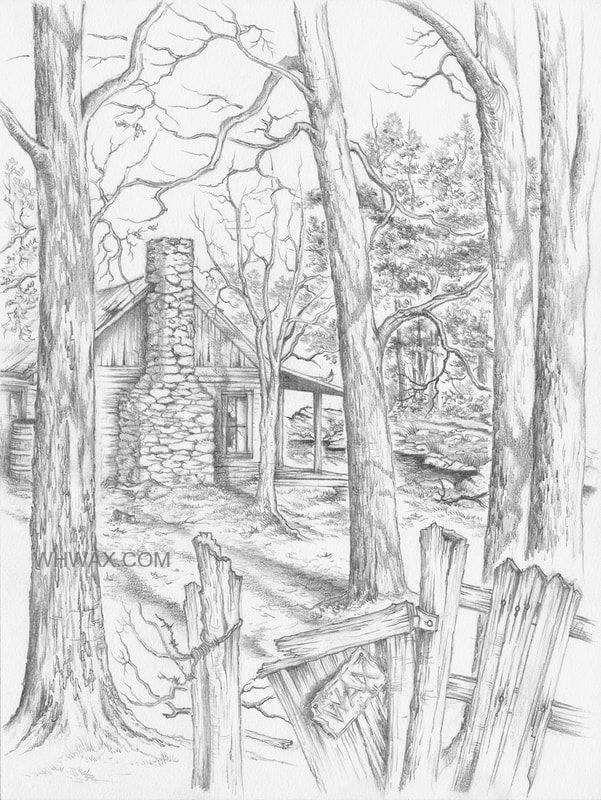 This illustration takes place in the Caney Creek Wilderness Area out from Vandervoort, Arkansas. The water fall in the illustration is flowing a little more than it normally does, depending on the time of year and there are actually dogwood trees all around it. The black and tan coonhound I added, his name was Clyde, named after the famous outlaws Bonnie and Clyde who were killed not too far from Ringgold, Louisiana where we raised Clyde. I also raised box turtles when I was a kid so I had to include my turtle who's name I can't recall, I believed I would build an empire one day raising and selling turtles, lol! I used to catch night crawler worms and put them in a can to go fishing with so I had to include that. The girl, well, she may have just been made up for the illustration, probably someone I had a crush on as a child. The original sold in Chanute, Kansas. "Wild Card" - Buy Now! ​An artist’s proof is the first print or a series of prints produced by a professional printer from the original artwork to see if the printing is conforming to the colors, tones, texture, and quality of the original artwork. Here we have the 8"x10" artist proof "Bistineau Landing" of which only two proofs were produced. Artist proofs are signed and sometimes numbered, depending on quantity of proofs. Each proof includes a hand embossed certificate of authenticity signed by the artist and the printer. Notice that the "Bistineau Landing" proof actually list me as "Artist: Bill Wax" since the printer, family and friends know me as Bill, I have signed all my work as W.H.Wax since I think 2014. Bistineau Landing - Artist Proof CLICK HERE TO buy now! Open edition prints are prints produced in unlimited quantities, not limited, and generally should cost less. However, our prints are still signed by the artist with a signed certificate of archival authenticity. If the number of prints is predetermined and limited, the edition is then referred to as a limited edition an would be considered more valuable in the future. ​My premium archival open edition giclée prints are captured from the original artwork and created with 100% quality cotton paper and fine pigment inks, Each print comes signed with a hand embossed certificate of authenticity signed by the artist, W.H.Wax and Fine Line Supply Company archival printing. God's Bleeding Dogwood is very special to me. 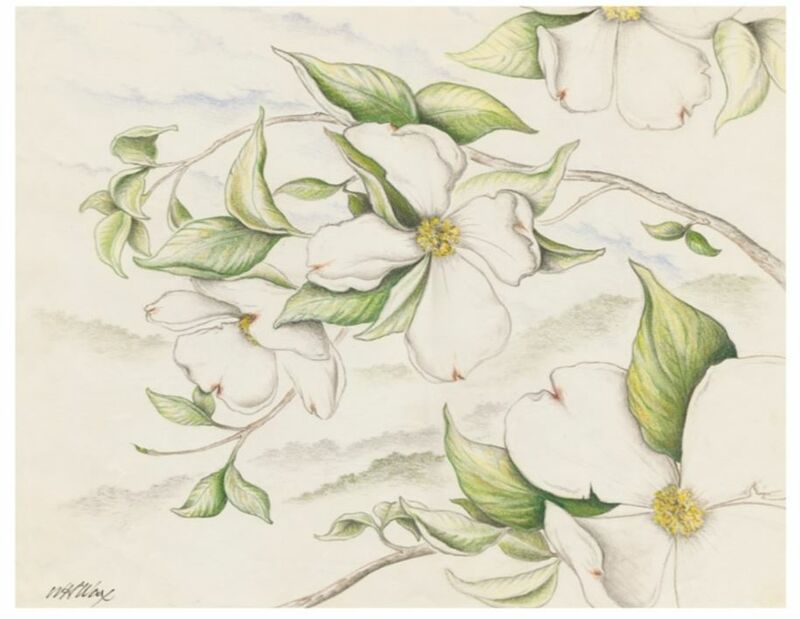 I created this piece for my Mom because I will always remember her telling the story of about God's bleeding dogwood. In Jesus time, the dogwood grew to a stately size and a lovely hue. ‘Twas strong & firm it’s branches interwoven for the cross of Christ its timbers were chosen. “Never again shall the dogwood grow large enough to be used so slender & twisted, it shall be with blossoms like the cross for all to see. As blood stains the petals marked in brown the blossom’s center wears a thorny crown. All who see it will remember me crucified on a cross from the dogwood tree. RELOAD - click here to BUY NOW! Reload was originally titled "Sportsman's Paradise" until I was showing it at an art show and a man walked up and said "Boy you'd have to make sure you had enough shells to reload if you walked up on that place". I thought that was funny so I changed the name to "Reload". 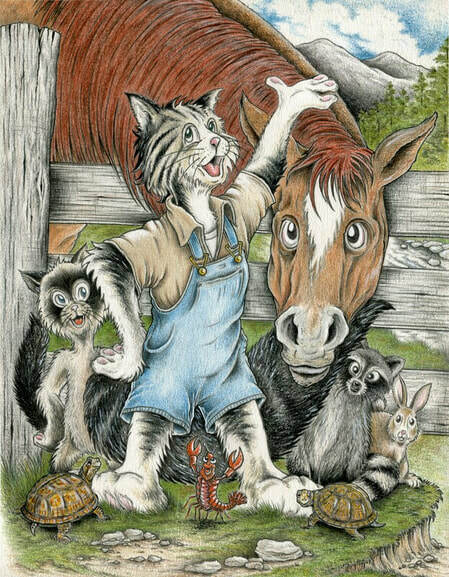 If I remember correctly there are 21 animals in this hidden picture style drawing. I used to joke with people and tell them there were 22 and they would look and look until they finally gave up and said where?....I would tell them there is a catfish at the bottom of the lake. Available for $350.00 plus Shipping and Handling. Copyright © 2014 - 2018, W.H.Wax. All Rights Reserved.